The centre-right group in the European Parliament has voted to suspend Hungary's Fidesz party until further notice, European People's Party President Joseph Daul announced. "The suspension entails: no attendance at any party meeting; no voting rights; no right to propose candidates for posts", Daul specified in a tweet. Meanwhile, Hungarian Prime Minister Viktor Orban is holding a press conference jointly with European People's Party Vice-Chair Jozsef Szajer and Minister of the PM's Office Gergely Gulyas in Brussels. Commenting on the result of the vote, Orban announced the party agreed to suspend its activities in the bloc voluntarily until an independent commission completes a probe into the state of rule of law in Hungary. Earlier in the day, the Hungarian PM's chief of staff Gergely Gulyas warned that Fidesz would immediately leave the conservative bloc if suspended, explaining that "it is about the dignity of the party and the country". Hungary's Fidesz party has been on the brink of being expelled from the European Parliament's centre-right group amid a row over Budapest's anti-migration campaign targeting the European Commission's migration policies. 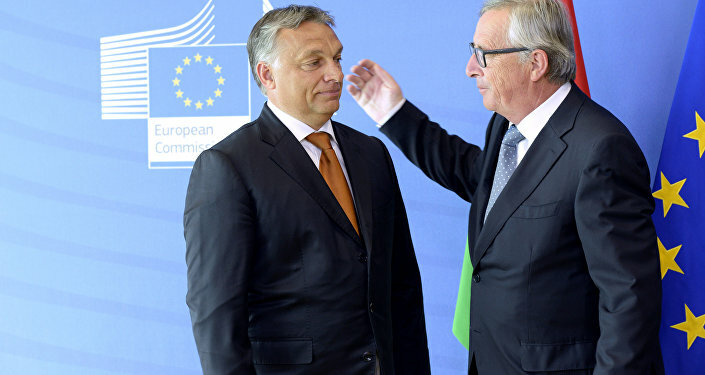 The Hungarian prime minister, Viktor Orban, called EPP members urging for his party's exit "useful idiots", whose attempts to exclude Fidesz would benefit only the EPP's opponents on the left. The outrage of European lawmakers was connected with a campaign against EU migration policies launched by Budapest in February. Apart from that, Hungary has been at odds with the EU over a "Stop Soros" bill, adopted by the country's Parliament in 2018, which criminalised giving unauthorised assistance to illegal immigrants and allowed for the imposition of a ban on the activities of pro-immigration human rights groups. The Hungarian prime minister has repeatedly accused billionaire George Soros of promoting mass immigration in order to undermine European countries, thus the bill forced the Soros-funded Open Society Foundations NGO to pull out of Hungary.